After spending a while trying to find some new wall art to put in my bedroom and office I decided to make my own as I couldn't find anything that was cheap and really caught my eye. 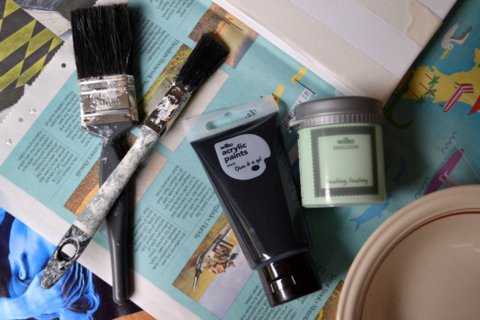 Both rooms are in a pale green, white colour; my bedroom I wanted to do something black and white and for the office I wanted something more colourful. I picked up all the supplies I needed from Wilkinson's who have a big crafts section and everything is very cheap. 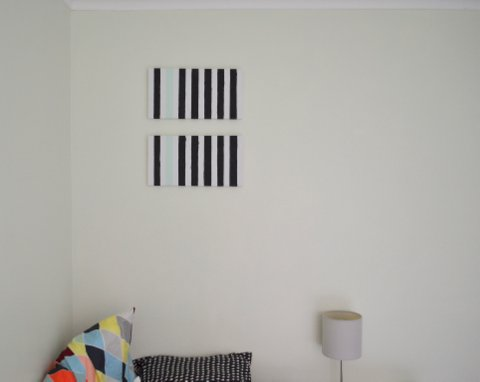 To do the stripe canvas' I mentioned the canvas and went for about an inch for each stripe. I used masking tape to help make sure the gaps between the stripes were even. 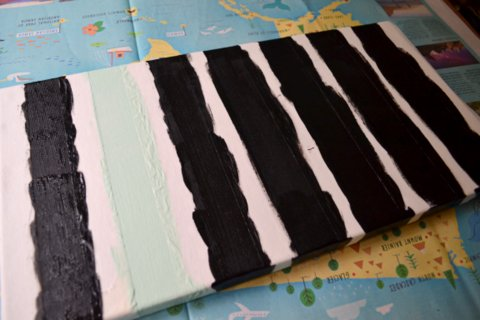 I used black acrylic paint for the black stripes which only need one coat. I also opted to do one mint stripe to help it match the colour of the walls. I got a sample pot to do this; both of these cost around £1 each. I carefully painted the stripes on and then left it to dry for a few hours before removing the masking tape. I will say one some of the stripes they didn't come out perfectly straight so I may touch them up with some white paint in the future. I think they turned out really well, I like how simple the design is and it breaks up the plain wall without being too in your face. For the office I decided to do a piece which I had seen on Pinterest a few times. The effect looked really cool and seemed easy to do. I used a acrylic craft glue to stick the crayons onto the canvas; I left this to dry over night to make sure they wouldn't move. I decided not to use any of the blacks/browns in the pack as I thought it wouldn't mix well with the other colours; I did but similar colours next to each other for example blues next to purples. 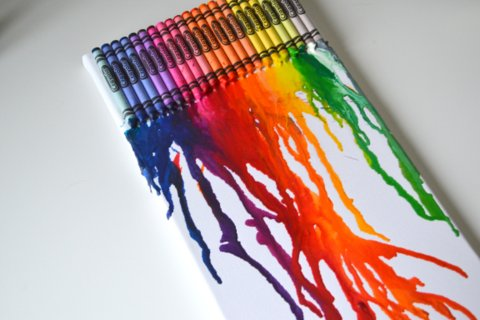 I then go a hairdryer and started to heat up the ends of the crayons. I would advice covering your work surface as the wax can splatter a little. I stood the canvas up so the wax would melt down. It's really fun to watch it move down the canvas and you can move it to stretch the lines out. 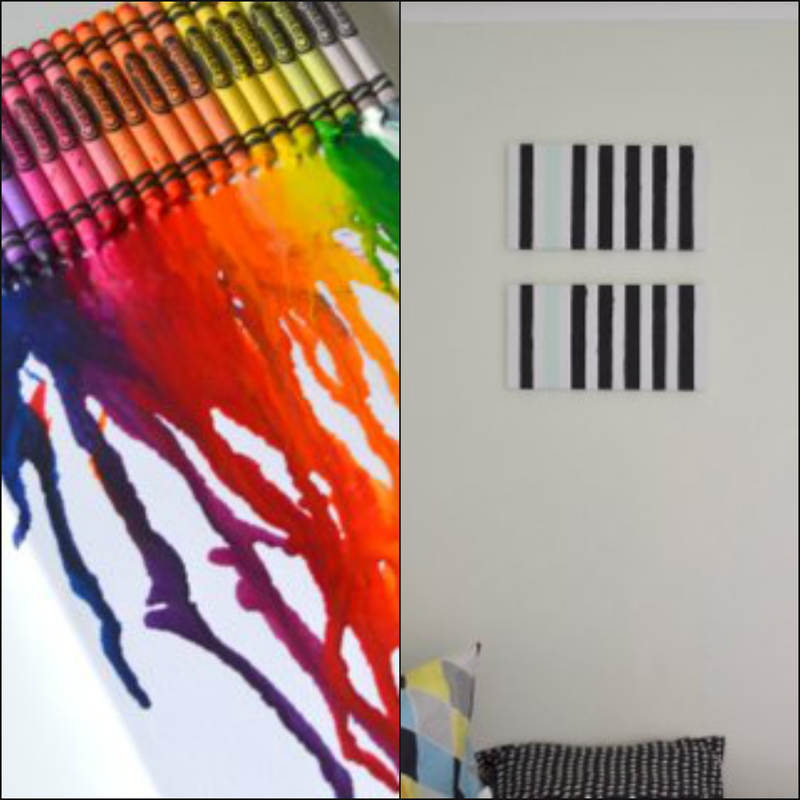 I think it would be really cool to this with pastel crayons or maybe just using pink shades or blues to match the colour of a room. Both of these DIY's were really easy to do and all in all cost me less than £10 for everything I needed which is a pretty good deal. I would definitely recommend trying to do your own canvas art if you want to had some colour into a room. Have you do any canvas art?